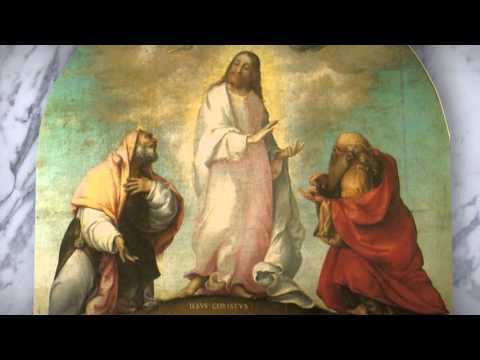 Lorenzo Lotto’s Transfiguration of Christ is the central panel of a three-part altarpiece created for the church of Santa Maria di Castelnuovo in Recanati. This piece shows the influence of the great Renaissance painters and captures a moment in Lotto’s transition as an artist. We see Renaissance proportion and balance, which will later give way to Mannerist exaggeration, elongation, and tension. In one way, this transition itself echoes the story of the Transfiguration, a moment of heavenly order and balance that will give way to the tension and disorder of the Passion after Christ and the disciples descend from the mountaintop. We see this juxtaposition of balance and imbalance in the arrangement of figures in the scene. At the top of the image we see Christ flanked by Moses and Elijah, in a triangular composition oriented toward heaven’s presence breaking in at the very top with God’s vertical words, “This is my Son, my Chosen; listen to him.” Heaven’s light from above illuminates this scene, as the clouds and angels narrow in a reverse triangle leading to the figure of Christ. In contrast, we see the three jumbled forms of Peter, James, and John against the dark hillside below. If the scene above conveys order and balance, then this one below conveys disorder and disarray, though not completely. Lotto’s placement of heads, hands, and feet save the three Apostles from complete chaos by rooting the composition in a varied but intentional repetition of these forms. This slight emphasis on heads, hands, and feet is perhaps an allusion to the Passion to come, and to the foot-washing scene in which Peter offers all three of these for Jesus to wash. Heads, hands, and feet are symbols of discipleship: to believe, to serve, and to follow the way of Christ, in and through our imperfect, shaded, jumbled human existence. While still in our jumbled and imperfect reality, focus on Christ is our clear way forward. Rather than condemning our mess, Christ meets us in it fully, leading us and the disciples from this mountaintop experience all the way to the cross. Entering our broken reality, Christ shows us that the cross and all that leads to it is real, but death does not have the final word. Listening to Christ as God commands, we find hope and joy in that mystery.